A bright green, kid-friendly monster does visualizations to defeat a cold in Madden’s children’s series debut. The sick “buddabug” Zenji, with his green and teal fur, long wings, and pitiful expression, is sure to grab young readers’ attention from the first page of this book. The preschool crowd will identify with his ailments, too: “His chest was wheezy, his forehead was clammy, and his whole body ached. In fact he was feeling rather cranky indeed.” Stuck inside with no friends but his teddy bear, Zenji is bored until Karma, the “little voice that lives inside” his head, appears to help guide him through a mindfulness drill to help him sleep. 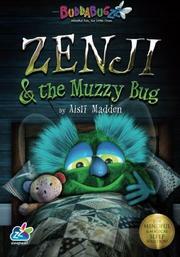 After he’s relaxed, Zenji envisions himself traveling through his own body to fight off the “muzzy bug” that’s keeping him sick. The soporific text’s meditative nature is perfect for youngsters who have trouble going to sleep at night. However, the idea that meditation helps children to use “magic” to get rid of their colds may frustrate some sick children and their parents. Madden’s computer-generated illustrations are charming throughout, especially when they combine words and images, as when Zenji learns to breathe in good, healthy air and breathe out what’s making him feel bad. The repetition of words such as “down,” “smaller,” and “deep,” among others, will help adult readers deliver the text slowly to children. The book’s guided journey through each part of the body will be very helpful in introducing kids to this style of mindful relaxation. The amount of text per page isn’t overwhelming, and newly independent readers may do well on their own, particularly given the text’s occasional use of rhyme. The title will likely work best as a read-aloud when a sleepy child is already under the covers. A vibrantly illustrated, relaxation-focused sleep story that has plenty of appeal.